Reprint. This edition originally published: 1996. "A true genius . . . Roald Dahl is my hero" - David WalliamsBoggis is an enormously fat chicken farmer who only eats boiled chickens smothered in fat. Bunce is a duck-and-goose farmer whose dinner gives him a beastly temper. Bean is a turkey-and-apple farmer who only drinks gallons of strong cider. Mr Fox is so clever that every evening he creeps down into the valley and helps himself to food from their farms - and those GHASTLY farmers can't catch him! Now the farmers have hatched a plan to BANG-BANG-BANG shoot Mr Fox dead! But, just when they think Mr Fox can't possibly escape, he makes a FANTASTIC plan of his own . . . 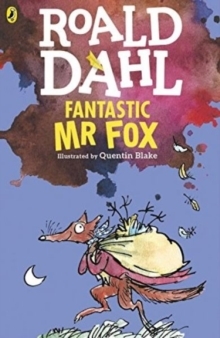 Listen to FANTASTIC MR FOX and other Roald Dahl audiobooks read by some very famous voices, including Kate Winslet, David Walliams and Steven Fry - plus there are added squelchy sound-effects from Pinewood Studios!